As travellers are running to catch their flights, construction workers are in no less of a hurry to complete work on piers F and G. Why? 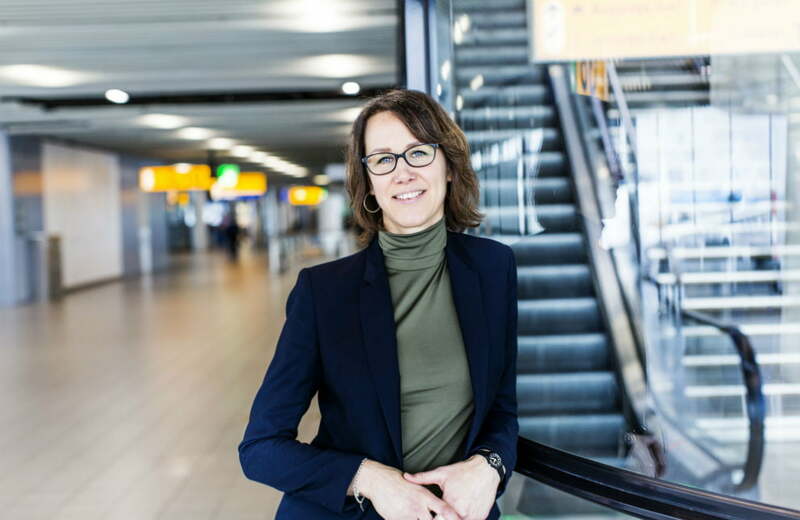 ‘So travellers will soon be able to truly enjoy the experience of waiting for their flight’, explains Amanda Boes, senior project manager. The work on piers F and G is in full swing: a number of shops and restaurants have been added to the base of pier G and a new toilet block has been opened in accordance with the Toilet Spa concept. Ninety-five percent of this partial project has been completed. The ceiling still has to be closed and some of the installation work still needs to be carried out. The Base of the new Pier G will be completed at the beginning of 2019. Pier F and the stem of Pier G have been completed for 70%. The summer of 2018 saw the opening of a new and luxurious toilet block at gate G6 and a MOODs, a new catering concept, at F5. We are currently constructing a commercial square at the heart of Pier F. The square will soon boast a Dutch Discoveries shop, a See Buy Fly shop and a WHSmith. At the end of 2018 we will finish the seating area at the landing on pier F. In addition to seats, two large tables with living trees will be added. A perfect fit for the green look and feel we want to create. For example, at the heart of the F pier you will find terrazzo floors and natural stone walls that will also eventually be reflected in the remaining piers, ensuring consistency in look and feel. The renovation work on piers F and G will be complete in March 2019. This not only means more comfort for travellers, but airline employees and business partners will also notice a higher level of quality. “Travellers can work, relax and shop in comfort. Each pier has a commercial square and the waiting areas at the gates offer more seating comfort to various types of travellers. It is an innovative and sustainable project and the results are truly wonderful’, says Amanda.